Home » The Auction Process » When Is The Best Time To Have An Auction? One of the most common questions that I am asked is, “When is the best time to have an auction?” The question is nowhere quite as amusing as the answer. The short answer is, on days when there is snow, rain or holiday weekends. Okay, cute. What’s the real answer? That is the real answer and I’ll explain in greater detail. First of all, this is important so let’s get this out of the way. To quote the 1989 baseball movie, Field of Dreams starring Kevin Costner. “If you build it. They will come.” The same principle applies to auctions held any time of year. AUCTION SEASON: In the auction business, the months April-August, give or take a month are commonly referred to as ‘auction season’ for the simple reason that this is when the majority of auctioneers are requested to conduct estate type of auctions. However, it isn’t necessarily the ‘best’ or ‘optimal’ time to conduct an estate auction. Here’s why. Your buyers are engaged in many activities this time of year which kicks into full throttle from June to the beginning of September. High school graduations, outdoor weddings and receptions, the family cottage, the kids baseball games, golf leagues, flea markets, garage sales, estate sales, other auctions and the list goes on and on. The fact is, in the Midwest, folks are more engaged in leisure and family outings in the summer months than any other time of year. So what does this mean? That you should not have your auction during auction season? Not at all. It all comes down to timing and what day of the week will be most advantageous for your estate auction. We’ll discuss this below. WEEK DAY AUCTIONS: One of the best kept secrets, even in the auction industry is the power of a week day auction. If coordinated properly, auctions conducted during the week are exceptionally good for certain types of auctions. For example, business liquidation including restaurant and industrial are best suited for weekday scheduling. The reason is quite simple. Business owners oftentimes send their employees to attend specific auctions to purchase items for the business. In many cases, it’s easier for a business owner to slip out of the office for a few hours and take care of business at an auction as opposed to slipping away from the family during the weekend. The other factor is, his employees are on the clock and are available to assist if needed. Smaller to mid size estate auctions are best slotted during the week as well. Fewer auctions take place during the week and attendance meaning less competition. It’s important to understand that auction buyers have options during the weekend of which auction they are going to attend. WEEKENDS ARE BAD? Weekends are not optimal for many business related auctions. For estate type of auctions, it is nothing more than a myth that your auction HAS to take place on a weekend. In order for an estate auction to realize its maximum potential on a weekend then you better have the merchandise to back it up. In other words, you have a pretty special estate where there is a wide diversity of marquee type of items. That means, you’re selling the boat, the tractors, the car, the firearm collection, the household appliances, the desirable antiques and collectibles. You have to remember that Saturday is the most popular day of the week for estate auctions so your auction better have the ‘WOW’ factor going on because you’ll be competing with other auctions in the area. But the other auctioneer I’m speaking with says weekends are the best! There is a 99% chance the ‘other’ auctioneer is not a full-time auctioneer. He has a regular 9-5 job and cannot take a full day off work to conduct your auction. There is a 1% chance, this auctioneer himself has bought into the theory that weekends are better. RAIN, SLEET, SNOW & COLD: PERFECT! Huh? Let me explain. Auctions conducted from late October-March and even into April are in my professional opinion, optimal. Less auctions are going on and folks have cabin fever. That’s an automatic. When the weather is poor, your attendance will blossom and I know that does not seem to make any sense. Here’s the deal. When the weather is poor it sends an illusion to your buyers that nobody is going to attend the auction in this type of weather. Wrong. Wrong and Wrong. The reality is, unless we are dealing with an Armageddon situation, your audience will potentially double or triple when the weather isn’t favorable. 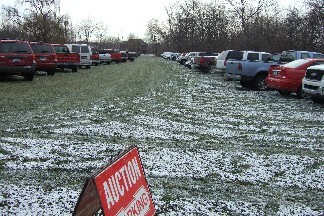 Human nature is a strange thing and there’s no way to predict the weather, but consider it a bonus if it’s cold and snowy outside – and this includes auctions held in the outdoors. Case in point. Shawn Dostie, an apprentice auctioneer from Coshocton, Ohio posted the following on an ‘AUCTIONEERS’ online discussion board. At 10 a.m. he posted to the message board, “Scared to death. Supposed to be my largest auction of the year and we are under a level 2 snow emergency. Hopefully clear by sale time but a lot of money invented and I don’t cancel or postpone…Here’s hoping for a turnout! Moments afterwards, dozens of veteran auctioneers chimed in to calm the panicked auctioneer. The HOLIDAYS! : You cannot compete with Santa Claus but some of the most successfully attended auctions are held during holiday weekends. Most preferably is Labor Day and Memorial Day weekend. In fact, I call these two weekends as ‘premium auction dates’ and I reserve such dates for marquee type of auctions. You may be thinking that this does not make any sense, people have all sorts of things going on during those holiday weekends. People go up North to their cottages. Well, that’s true but guess what? Most folks don’t have family cottages and most folks are off work and auctions held on these weekends attract many fresh bidders that we normally don’t see any other time of year. We can kick theories all over the place but auctions held on these premium dates are wildly successful. However, for full disclosure, we never have to worry about BIG auctions attracting a large and enthusiastic crowd. It’s the smaller estate type of auctions that lack significant marquee items (vehicle, firearms, real estate) where the professional auctioneer needs to be more strategic with determining the auction date. If you are more confused now than you were before you read this article, I understand. To the casual auction goer, it just does not seem to make much sense why poor weather auctions tend to fair so much better. To the experienced professional auctioneer, it makes perfectly good sense. 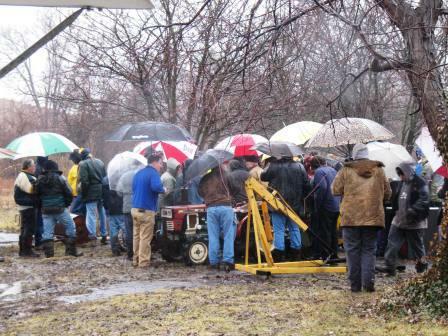 In short, when the weather looks bad, bidders comes out in droves. Why? Because nobody will be there and they’ll snap up some great deals……….or so they thought. I enjoyed this post Kenny! Thanks for directing me to it. AHA!